Articulation and comfortable protection take center stage, made possible with five different textiles, 10 panels, and three components. In other words, there’s nothing standard about the RS Aero SF Gloves. The streamlined “no wrinkle” silhouette has been cut to form a curved 3D shape, mimicking the intricate anatomical structure of the human hand as it grips the bars. At the back of the hands Assos applied Breezer Tex, an ultralight woven fabric with mesh-like structure, which promotes breathability and delivers an ultrasoft feel. Strategically positioned triangulated pads on the palm deliver light support and protection, without blocking necessary feedback from the bar. The resulting gloves had a superlight layer, free of bulky fasteners and fabrics, for a smooth low-volume wrap across the hands. Breezer Tex: An ultralight woven textile with mesh-like structure that promotes breathability, constructed with thin yarns to keep the backs of the hands cool and dry. Perforated Synthetic Leather: A durable, lightweight material that promotes grip, while also supporting and protecting the hand. Palm Padding: Strategically positioned triangulated pads flex with hand to eliminate hot spots and bunching. Anatomic Cut: “No wrinkle” construction creates a 3D curved structure, made possible using five separate textiles and 10 panels. 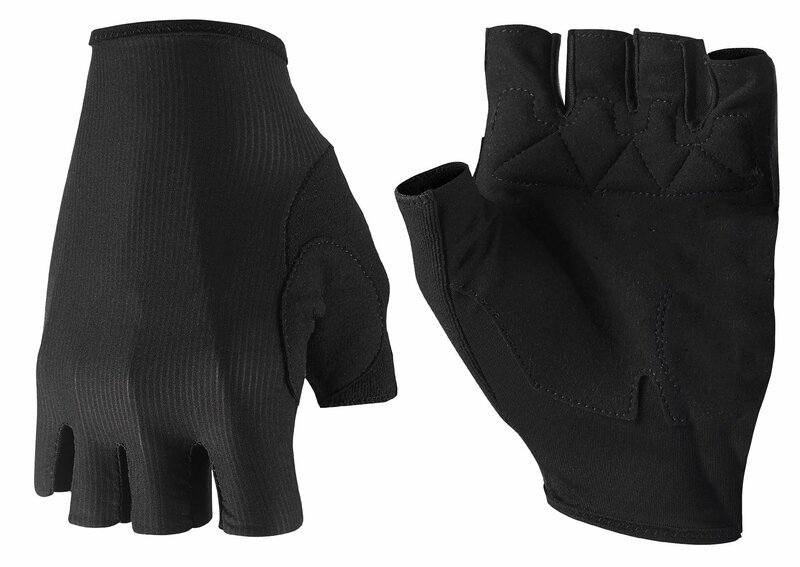 Terry Thumb Panel: Highly absorbent material aids in wicking moisture from the skin’s surface.